The glass in the chancel is much older than the church and was probably installed in Victorian times. it is "jumble glass", a method of glazing introduced by the Victorians using fragments of old glass to create the designs. Most of the glass came from the hall and chapel at Doddington, demolished after Sir Thomas built the new hall. Some came from Wynbunbury church, which had been built on a geological fault and had to be rebuilt on several occasions until finally rebuilt on a different site. 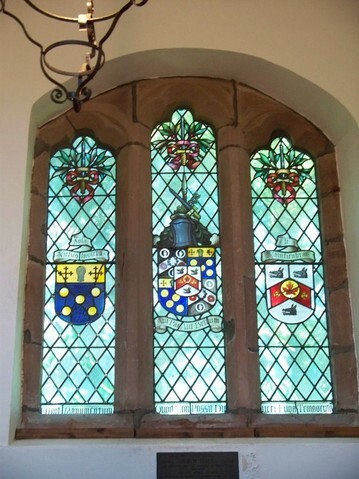 The North window in the chancel contains three lights, is totally heraldic and records the marriages of various Cheshire families. The original location of these coats of arms could have been inside the old hall at Doddington. Note the Pascal Lambs at the top of the two outside lights. The one on the right is a later copy of that on the left. 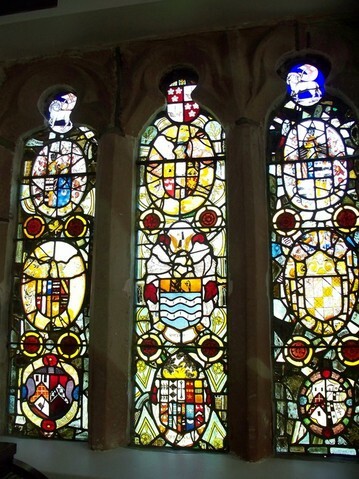 Note also the fragments of medieval glass used to fill in the panels, especially the Rambler Rose design that surrounds the central panel. It seems that the glazier had one piece spare and inserted it in the left hand light. These three lights are a most beautiful window, especially in the morning sun, when the deep colours really glow. The church is dominated by the East Window. It ascends from three feet above the floor right up to the roof and is nearly as wide as the chancel. The lower lights contain four heraldic devices. The two centre ones are almost identical and record the marriage of Sir Brian Broughton and Elizabeth Delves in 1711. Once more note the fragments of glass that have been used to fill in the panels, especially the right hand panel where pieces of Rambler Rose used in the North Chancel window have also been inserted. If you look at the base of the left central panel you will see a 'Devil's eye'. Above the lower light are four figures meant to represent four saints. The first figure, St David, is in fact made of two different figures, the legs of a 15th century knight and the torso and head of a saint. You may see the remains of a numbus on the forehead, surmounted by a 16th century crown. The second figure of St George is complete and dates from the 15th century. The third figure, thought to be St Patrick, is in fact a French saint, St Roch. Note the left hand pointing toward a plague spot on the inner thigh. This figure is also 15th century and complete. The fourth figure of St Andrew is worthy of note. At first glance it appears to be a very crude representation but the left side of the figure, as you face it, is medieval [the book and the robes], while the rest was added by a not very talented glass artist and is poorly made: since the colours are flaking. The tracery lights above are a wonderful collection of glass from different periods and are well worth closer inspection. Sitting in the chancel with a pair of binoculars and reading from left to right one finds a small Flemish scene of the circumcision and another Flemish scene of the crucifixion. Above are several coats of arms, one is a passion shield. One the right of the window the date 1553 can be seen and above it to the right are three men and two women in Tudor dress. This fragment was from a larger scene since there were originally three women. The third has been broken off to fit in - and she has been fitted into the scene above. If you look carefully you can see her face peeping out. Originally it was probably a larger scene with a congregation addressed by a priest. 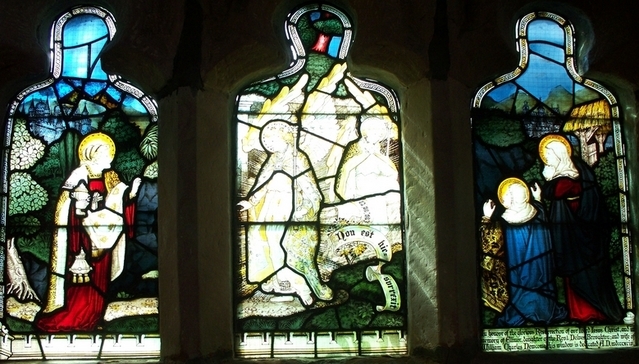 The south chancel window contains the oldest glass in the church. On the left light is the Virgin Mary and on the right a 14th century depiction of St Francis with a tonsured head, in monk's habit and showing the marks of the stigmata. Below are two kneeling figures. These represent St John and Lady Delves. Sir John was killed at the battle of Tewkesbury in 1471 fighting on the Lancastrian side. These figures were originally in Wynbunbury Church. A sketch in the book of the family history [a copy is in the William Salt Library in Stafford] is an exact likeness. 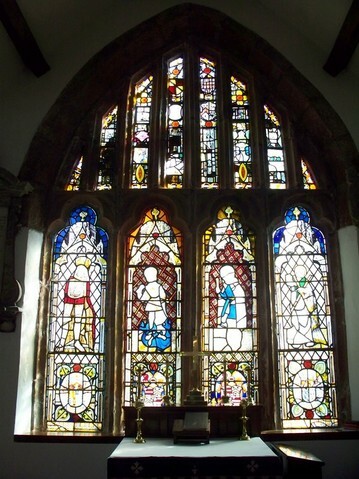 The nave windows - the south aisle, contains a Kempe window depicting the two Marys and Salome at the tomb. A typical Victoria window, which contains a great deal of detail and may seem over-ornate by today's standards. It is to the memory of Ellinor Broughton, daughter of Reverend Delves Broughton and dated 1892. The window in the east of the south aisle is a memorial to Ralph Delves Broughton who served with the Lancers and died at Simla on 17th July 1888, his 22nd birthday. 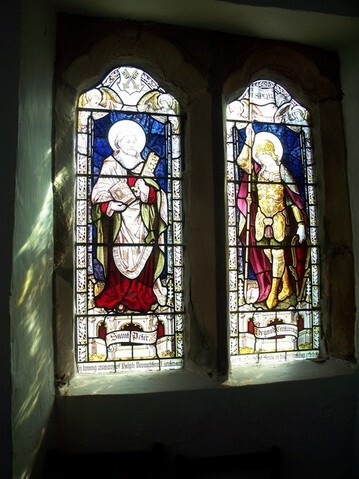 This is not a Kempe window and depicts a very effeminate 'Good Centurion' and a very stern looking St Peter holding the keys. The east window in the north aisle is arguably the most beautiful window in the church. It is pre-Raphaelite in style and executed by a very talented artist. 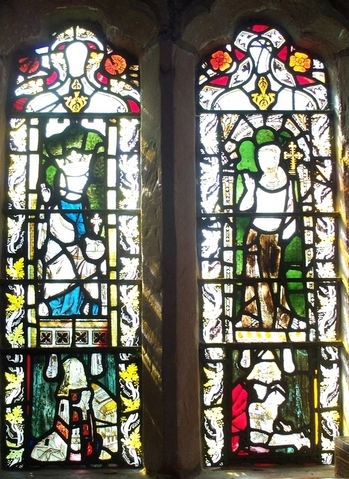 The window is a memorial to the Glory of God and the memory of Rosamund, wife of the eldest son of Sir Henry Delves Broughton of Doddington Park, who died at the age of 23 on 11th October 1885. 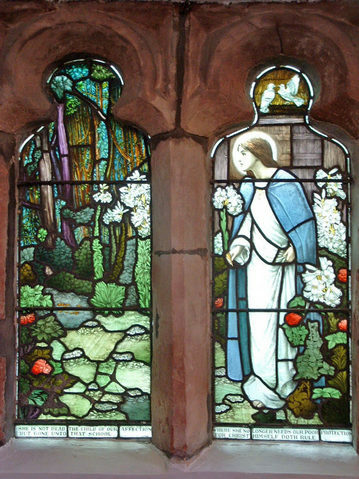 The west window is a memorial to John Hall, 1870-1930. The window is in three lights. The Coat of arms of John Hall is centre: the Byfield coat of arms and motto of the left, the Nesbitt coat of arms and motto on the right. At the head of each light appears the Hall badge, while the bottom of window is inscribed: XEGIT MONUMENTUM QUAD NON POSSIT DIRUER, FUGA TEMPORUM [He has raised a monument which the flight of time cannot destroy]. A fitting epitaph for a man who did so much for the church and the estate and the community.